Everybody loves a bargain, but "cheap" is not what you want when replacing auto glass. Besides its obvious role in safe visibility, a windshield supports the roof, keeps occupants inside the vehicle and preserves the structural integrity of the passenger compartment in the event of a crash. The National Highway Traffic Safety Administration reports that more than 40,000 Americans are killed and some 5 million are injured every year in highway crashes. More than 30% of fatalities occur when vehicle occupants are ejected from the vehicle. There are no laws that govern windshield replacement once the vehicle leaves the factory. An incorrectly fitted windshield could, and sometimes does, become detached from the vehicle during airbag deployment, from the force of a collision or if the car flips over. With the windshield displaced, the effectiveness of the vehicle's safety response system is seriously compromised. The tragedy is that the average person will not know their windshield was improperly replaced until it is too late. What should you look for when arranging a windshield replacement? 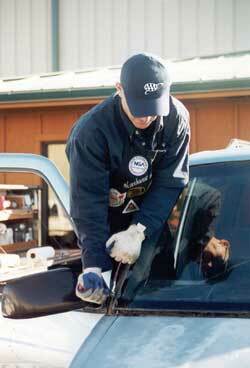 Endorse the Auto Glass Replacement Safety Standard (AGRSS). Use the manufacturers' recommended urethane adhesive. Review the "dos and don'ts" of post-installation usage with customers. During the installation, there are several things to watch for. Technicians should check for a passenger side airbag and use urethane-rated glass for that type of installation. They should remove the old sealant, leaving an approximately 1/16-inch bonding surface. Gloves should be worn to avoid contaminating the bonding surfaces. Both the glass and the area on the vehicle where the glass is to be set should be cleaned and primed. Ask to see the manufacturer's expiration date on all preps, primers and adhesives to be used during the windshield replacement. If any of these materials are past the expiration date, do not allow the installation to begin until acceptable materials are located. If the installation is already in process, it must be stopped and started again from scratch after all bonding surfaces have been thoroughly cleaned. After the installation is complete, inspect the work from outside the vehicle. The windshield is perfectly centered. The distance between the left side and the right side of the windshield and the auto body should be the same. The molding fits around the circumference of the windshield with no visible gaps. The molding is flat. It should not look like a roller coaster. The glass is flush to the vehicle's body. This is probably the most important element. To be done properly, windshield replacement requires the use of the best materials technology can provide and the skills of highly trained, experienced and detail-conscious technicians. AAA recommends using a facility with NGA-certified technicians.